By the mid-1950s, the statehood movement had developed strong support among many Alaskans. Several grassroots organizations, such as "Operation Statehood" and the "John Q. Citizen" campaign, were formed to support the movement. In 1955, at the Constitutional Convention, which was held in the newly appointed Constitution Hall at the University of Alaska-Fairbanks, Ernest Gruening delivered a speech entitled "Let Us End American Colonialism" and Bob Bartlett, delegate to the U.S. Congress, delivered a speech entitled “Meeting the Challenge.” The convention, both speeches, and ultimately the constitution born from the convention, received national attention and significantly helped promote the idea of Alaska Statehood in the U.S. Congress as well as in the rest of the United States. Establishment of a gross production tax on oil and gas. Created the Alaska Oil and Gas Commission. "Alaska's Flag" is adopted as the official song of the Territory. Alaskans elect 55 delegates from across the Territory to the Constitutional Convention which is held at the University of Alaska-Fairbanks. 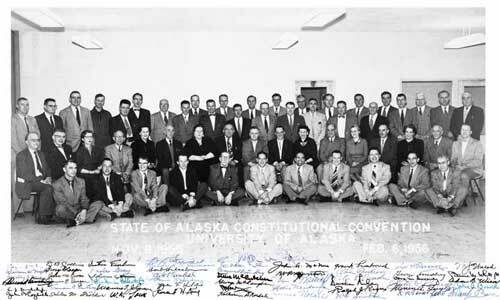 On February 5, 1956, the Constitutional Convention delegates adopt the Alaska Constitution which voters subsequently ratify and which later goes into effect at statehood. The U.S. Congress transfers responsibility for mental health programs to the Territory (Alaska Mental Health Enabling Act of 1956), which also grants one million acres as the Alaska Mental Health Lands Trust to support the development and implementation of mental health programs in Alaska. President Eisenhower sends the first U.S. advisors to South Vietnam. The AFL and CIO merge into the largest labor organization in U.S. history. The first seagoing oil drilling rig is placed in service. Disneyland opens to the public with an entrance fee of $1. James Dean dies in a car accident. The McDonald's Corporation is founded. In Montgomery, Alabama, on December 1, 1955, Rosa Parks, an African-American, refuses to give up her seat to a white man while riding on a city bus and is subsequently arrested and fined for breaking the laws of segregation. This event sparks the Montgomery Bus Boycott and is considered the beginning of the modern Civil Rights Movement.